Chris Childs submitted this shot. 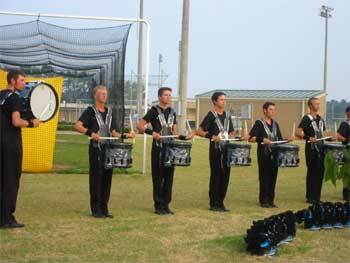 "This is a photo of the Teal Sound snare line (or at least most of it). This was taken at the show in Atlanta last summer. From left to right in the snare line, you can see Rob (Virgina), me, Chris (Atlanta), Kalyn (Texas), Mark (Florida), Sloth (Illinois) and Justin (Virgina). "One of the coolest things about the Teal drum line this year was that from the very beginning of the season, things were going wrong with staff, not enough people showing up at camps, etc. In fact, we actually changed percussion caption heads early in the season and weren't able to work with the new one (Tyler Dempsey) until the April camp. So you can guess how far behind other corps we were come move-ins. "Getting back to the cool part. We had drummers from all over the country (something you don't really see in a small, Division III drum line). The talent pool of the Teal drum line was unbelievable. The best part about this is that Teal Sound, in my opinion, never really flashed its true colors until the 2004 season. With the help of our great staff, and our talented drummers, we finally were able to bust into Grand Finals in Denver, where the entire corps ended up placing third in Division III, and the drum line won the high percussion award for Division III -- a DEFINITE first for Teal Sound. "It just goes to show that no matter what happens, with dedicated and determined musicans (and a heck of a lot of everydays), anything can happen. 2004 was most certainly a breakthrough year for Teal Sound. I'm now center snare for the 2005 Teal Sound drum line, and we once again have a great talent pool, so I'm very excited to see what happens this summer now that we get to work full time with our great staff. Watch out DCI!"